Bragi earbuds let you control your phone by tapping your cheek | What Hi-Fi? Bragi's new 'MyTap' update for the Dash wireless earbuds lets you operate Siri or Google Now by tapping your cheek. Yes, you'll probably look insane. 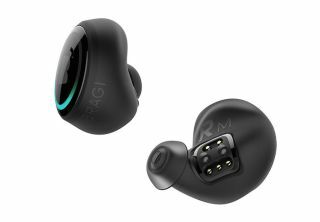 If you haven't heard of Bragi before, it's the company that brought out the Dash - completely wireless Bluetooth earbuds, similar to the Apple Airpods and Onkyo W800BTs. Now the Dash wireless earbuds are aiming to stand out from the crowd thanks to a new OS update, which lets you control music playback and access call functions using gestures rather than buttons. The company calls this "Kinetic User Interface". The first gesture to go live will be tapping your cheek to activate your phone's voice assistant - just in case you didn't look mad enough talking to Siri while using a pair of wireless earbuds. Set for release in beta on 21st November, the update lets you tap your cheek to activate either Siri or Google Now. A quick tap, and then you can start shouting instructions. It's currently unclear how the Dash will differentiate a deliberate tap from an itch, scratch or slap, but we suppose that's the thrill of living in the future. Currently, this is the the only gesture Bragi has introduced but according to the company more gestures, like nodding to accept a call, will be coming in the future. Head-banging to increase the volume, anyone? The Dash update also includes improvements to listening quality in windy conditions, better voice quality during calls, and more accurate heart rate measurements.